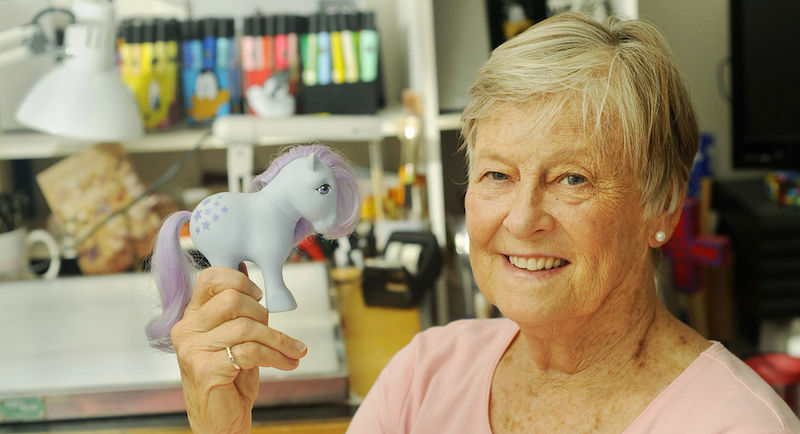 Bonnie Zacherle is an American illustrator and designer best known as the original creator of the My Little Pony toy line. In the late 1970s, Bonnie started as a full time artist at Rust Craft Greeting Cards. She also did freelance illustration on the side and managed to get some side work for Hasbro. In 1981, Zacherle conceptualized and sketched a line of realistic toy ponies, colorful and with “cutie marks” on their hindquarters to represent their emotions. Originally called “My Pretty Pony,” she initially wanted them to be more realistically colored. The colors and the name were tweaked, however, and the rest is toy industry history. She would go on to redesign Mr. Potato Head for a new generation, and help create and design other toy lines for Hasbro, such as Nerfuls. She is currently a writer, including, “My Lil’ Pony Tale,” her early history with My Little Pony. She also makes appearances at conventions and shows, to talk about her creation.